Paper Monument Poster #008: The City Hall Sit-In of 1963, a direct action led by the Rev. Avery C. Alexander, served as a pivotal moment in the history of the civil rights movement and racial equality in the city of New Orleans. Born June 29, 1910 in Terrebonne Parish, Avery Caesar Alexander grew up in a poor family. He entered the workforce as a boy, taking odd jobs until he earned work as a longshoreman. His family relocated to New Orleans and because he was forced to work as a child he was unable to successfully earn his high school diploma until he was 29, which he did by attending night school. He went on to graduate from Union Baptist Theological Seminary and became associate pastor at the Historic Second Baptist Church on Marengo Street. As a longshoreman, he had became active in the longshoremen’s union and eventually in the local chapter of the National Association for the Advancement of Colored People (NAACP). In the NAACP, he developed his organizational skills and led efforts for voter registrations, boycotts, marches and demonstrations. 1963 was an extremely difficult year in the Civil Rights movement on both the national and local levels. The interracial and inter-denominational Citizens’ Committee of Greater New Orleans, led a march against racial discrimination on September 30, 1963 to the steps of New Orleans City Hall. Following the march an 18-point petition was presented to Mayor Victor H. Schiro, the City Council, various business & civic leaders and to all of the local news media outlets. The protesters waited weeks for an official response from City Hall. But they were ignored. On October 31, 1963, Rev. Alexander launched a direct action campaign aimed directly at City Hall. African American protesters held sit-ins in the mayor’s reception area, the City Council chambers and the John Lynne Cafeteria located in the basement of city hall. They were asked to leave, and told that if they did not, they would be removed by force. Rev. Alexander, Sandra Nixon and two other young ladies held their sit-in at the cafeteria by asking to be served. When the employees refused to serve them, they refused to leave, and the young ladies were carried out of the cafeteria on their chairs which were removed while they remained seated in them. Rev. Alexander, however, was dragged by his feet out of the building. He was abused and beaten as his head hit the marble steps and floors, and was forced into a police wagon. 28 African American protesters were arrested that day. Eight African American employees who worked at the cafeteria walked off their jobs and the images of Rev. Alexander dragged out of City Hall by his feet made local, state & national news. The images of Rev. Alexander ignited a wave of protest, demonstrations and sit ins around the city. The 1963 City Hall Cafeteria Sit in was one of the catalysts that led to the final and complete desegregation of the city of New Orleans. 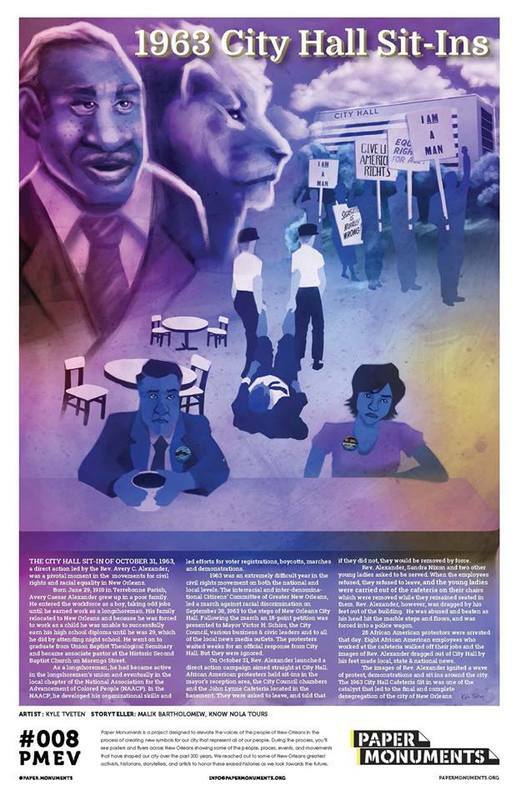 Paper Monuments, Malik Bartholomew, narrative, and Kyle Tveten Art, artwork, “City Hall Cafeteria Sit-In,” New Orleans Historical, accessed April 19, 2019, https://neworleanshistorical.org/items/show/1446.